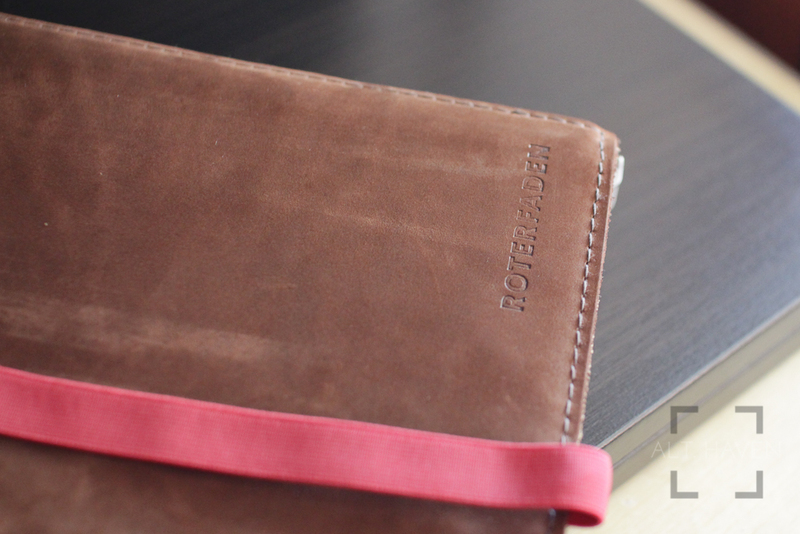 Roterfaden is a German company that specialises in notebook folio / cover made of leather or an intriguing material called dancefloor. (It’s actually just a synthetic material designed for ballet dance floor.) They create their own line of notebooks as well as accessories that work well with their notebook folio as known as Taschenbegleiter. The Roterfaden Taschenbegleiter, loosely translated as pocket companion, comes in A4, A5 and A6. They also handle custom sizes if required. WARNING: TURN BACK NOW IF YOU DO NOT WANT TO SPEND ALL YOUR MONEY! I opted to custom my own Roterfaden Taschenbegleiter. 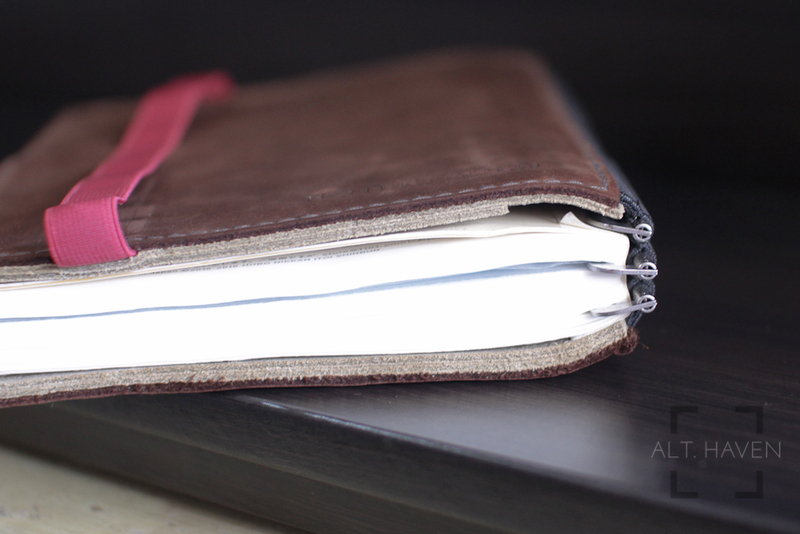 I picked an A5 sized one, with the brown leather exterior and the mud suede interior. 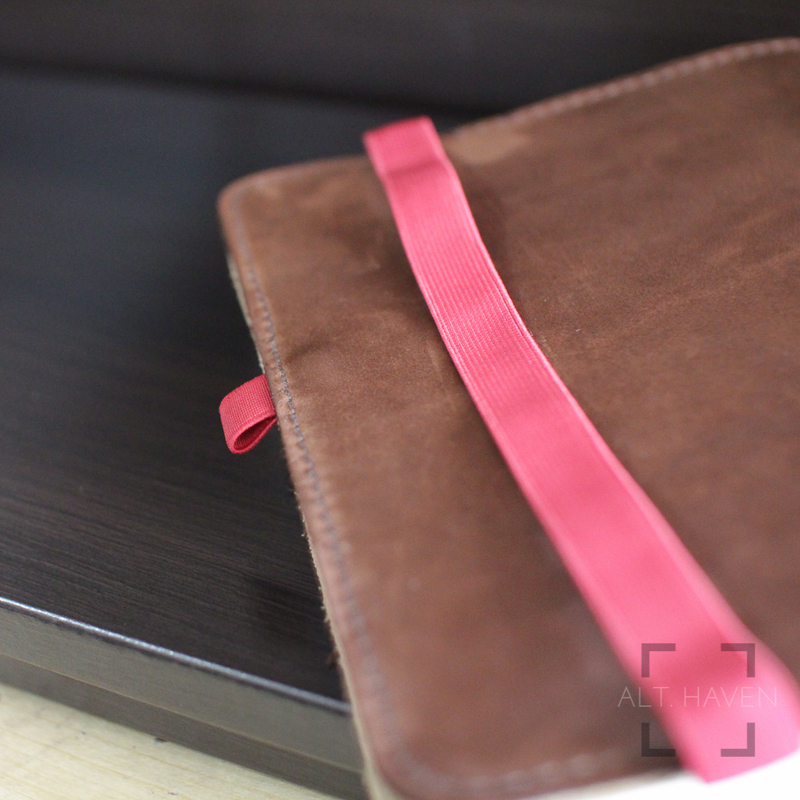 It comes with 3 clips, pocket combination 1 and is paired with the red elastic. I was waiting anxiously the moment I paid. It took about 3 weeks for my Roterfaden Taschenbegleiter to arrive and it was beautiful. After using my Roterfaden Taschenbegleiter for about 3 months, I can say there are pros and cons to the system. 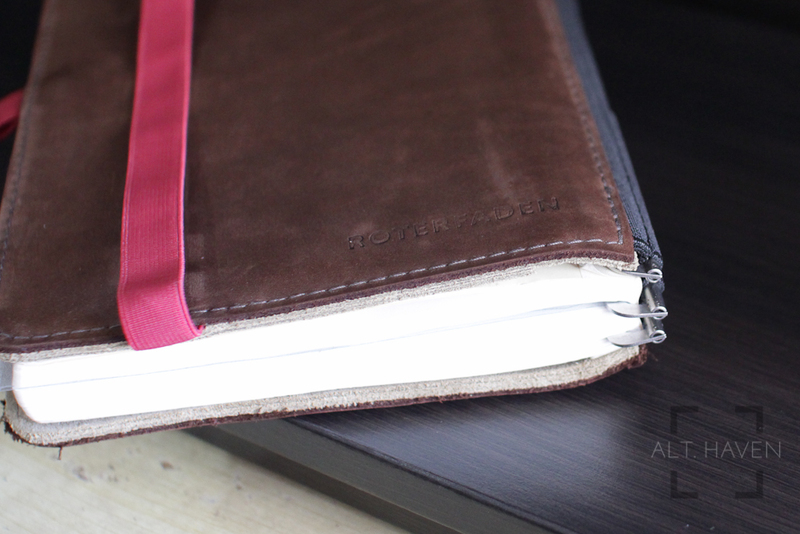 The star of the Roterfaden Taschenbegleiter system is the hinged clips that holds the notebooks inside the cover. It is strong enough to hold my A5 Hobonichi Techo with just one clip. The clips are that strong. What’s best is the clips can be removed if you do not require that many. The clips makes it easy to add and remove notebooks as you require. The exterior and interior materials that I’ve goes well together. However the edges of the Roterfaden Taschenbegleiter isn’t buffed like more leather cover I’ve used. This leaves it with a little more rustic looking. 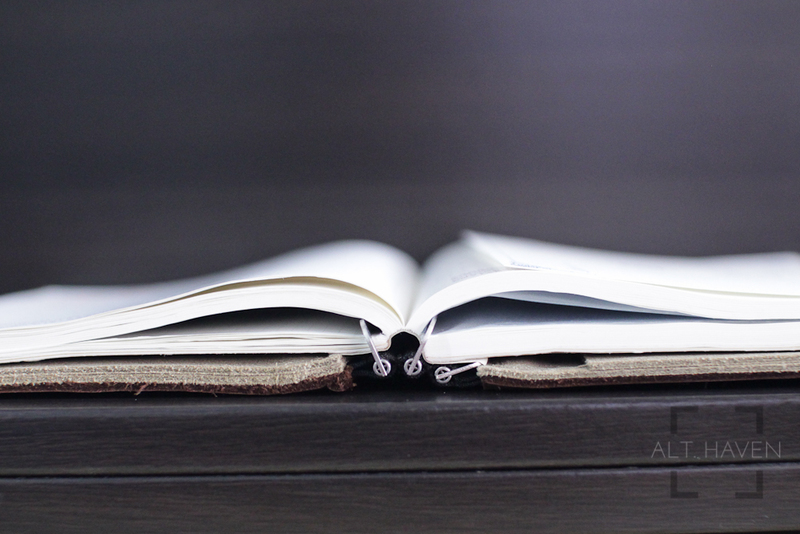 The two ends of the cover are stitched together with a black elastic spine. 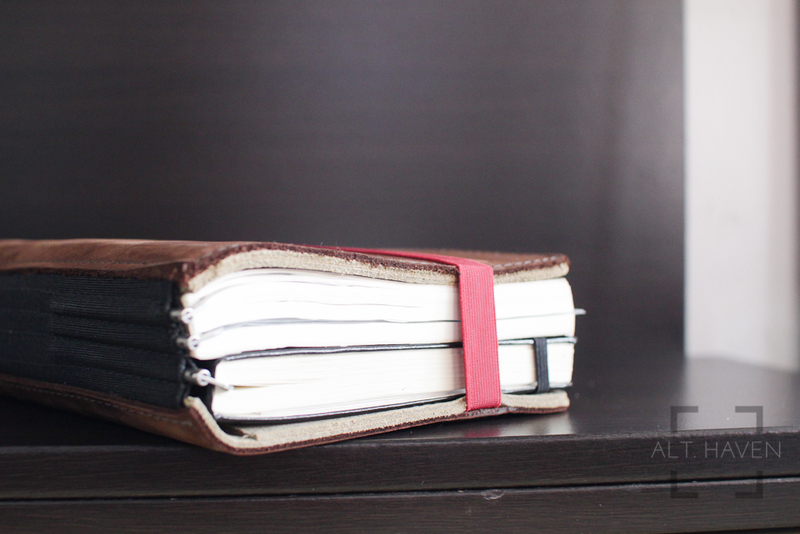 This black elastic can stretch a little to accommodate thicker notebooks like the Hobonichi. Finally there is a red elastic that holds the Roterfaden Taschenbegleiter close and a red pen loop stitched to the back cover. 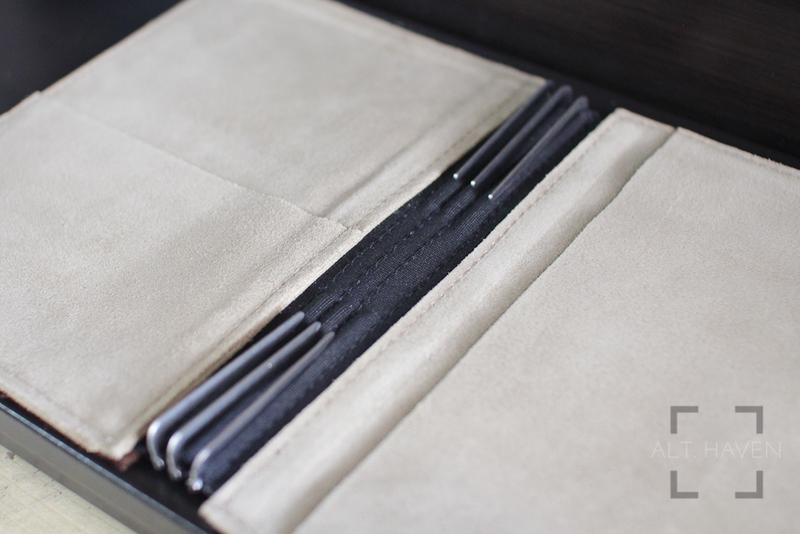 The Roterfaden Taschenbegleiter is a very well made notebook cover. My main complaint is the Roterfaden Taschenbegleiter is very thick and bulky even without any notebook loaded inside. This is compounded when I have a Hobonichi and other notebooks loaded in. Personally I would prefer if it was half the bulk. 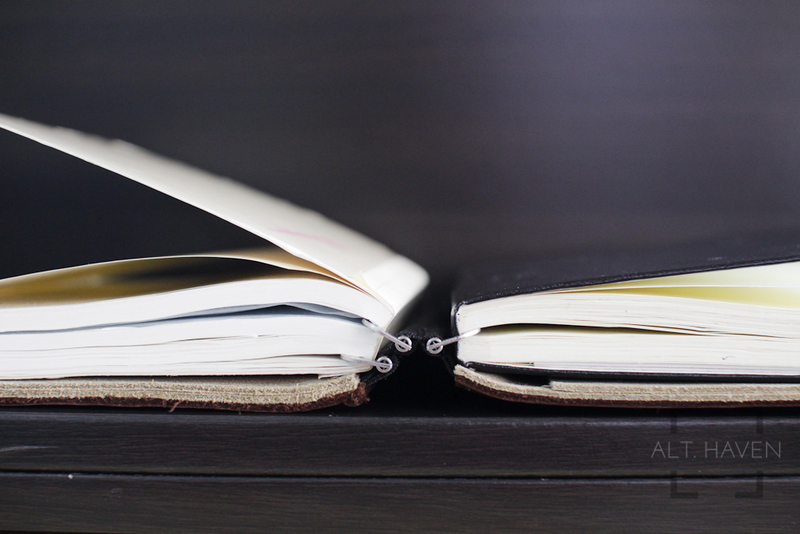 It might be due to the materials I picked or the Hobonichi is just too thick. I had initially wanted to have my A5 Rhodia Dot Pad live in one of the pockets but the backing cardboard is too wide to fit into the pocket. I’ve also picked up one of Roterfaden chapbooks to slip into its back pocket, that also didn’t fit. That made much less sense, I’d assume they would expect people to try to fit the chapbooks into their Roterfaden Taschenbegleiter right?c Finally, the pen loop is stitched on the outside of the cover so there is no protection for your pen. That’s really not much of an issue as long as you have the right pen in the loop. 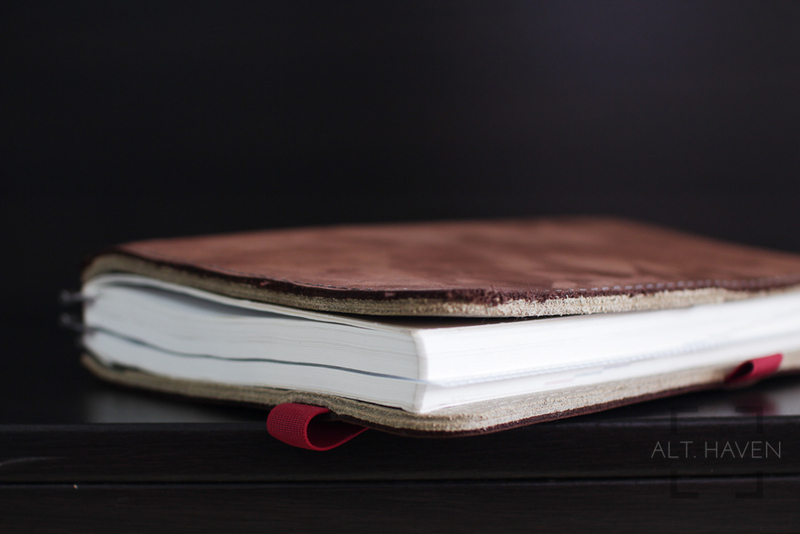 After 3 months of use, the Roterfaden Taschenbegleiter is holding up well and currently I am using it in rotation with another leather notebook cover. The flaws by themselves are not deal breakers especially when taking the clip system in account. Plus, it doesn’t require you buy and use only their house brand notebooks, this is a major plus in my opinion. It even takes some hard cover notebook like my Leuchtturm Bullet Journal. The Roterfaden Taschenbegleiter has its own set of pros and cons as with all other notebook cover. 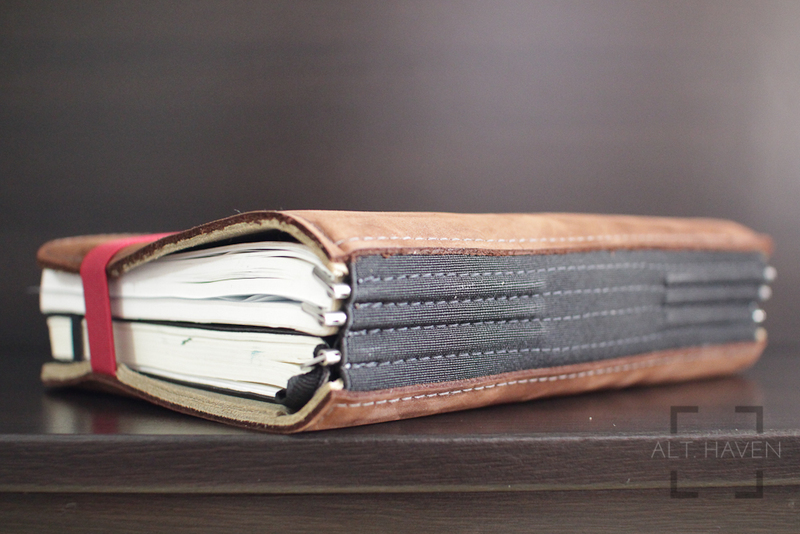 It is also not the cheapest option available too but it is one of the most versatile notebook holder I’ve seen out there. My current setup is the A5 Hobonichi Techo on the first clip, a Muji line A5 notebook on the second clip and a Rhodia Dot Pad not attached to any clip or pocket. Finally I have a Pilot Vanishing Point on the pen loop. It’s a rather bulky setup but once I am done with my Hobonichi, it should slim the Roterfaden Taschenbegleiter by a lot. I’ve written this review 1 month ago. Since then I have switched to the Traveler’s Notebook system because I found myself hating the bulk of the Hobonichi as well as the Roterfaden Taschenbegleiter. Though I have sold mine, it isn’t a knock against Roterfaden. I have my own quirks and hang-ups in the way I use my notebooks so what doesn’t work for me might be the perfect thing for you.